A collection with a modern style, specifically designed following the evolution of housing trends. In the Essence Line, shapes and profiles are renewed, without ever losing focus on quality. 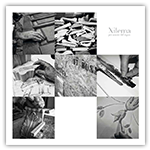 The models, characterized by a simple and linear style, are manufactured with the great attention to detail that distinguishes all the Xilema products. All doors are made of solid wood and you can choose among tulipwood, oak, chestnut and ash wood essences.